Google Earth overlays to the rescue! This is a tried and tested decision-making exercise using Google Earth. There's one file to download, then off you go! The lesson is suitable for both KS3 and KS4, differentiation will be evident in the outcomes. It is an ideal exercise with which to introduce some of the principles of GIS. A number of the new GCSE specifications for 2009 specifically mention decision-making in areas of tectonic hazards, as well as the need for students to be proficient in the use of technologies such as Google Earth. I have a PDF guide to the resource and an introductory video. The activity represents something of a personal Holy Grail. For several years I've got students to carry out a planning exercise to make San Francisco safer during major earthquakes. I used an excellent resource by John Widdowson in Earthworks 3 which essentially gets students to compare maps of seismic hazards and major roads and buildings. Using tracing paper, they plan some new buildings, taking into account the existing infrastructure and potential seismic hazard. For a while I tentatively worked on replacing the tracing paper with GIS layers, and the San Francisco GIS viewer in conjunction with maps such as the Hazard Map for San Francisco Based on Underlying Geologic Material enhanced the paper-based activity. Other resources at the ABAG earthquake site proved a valuable source of additional information for more able students. On this page I show how Google Earth can now be employed to underpin the decision-making process, acting as a comprehensive GIS that allows students of all abilities to analyse real spatial data with ease. 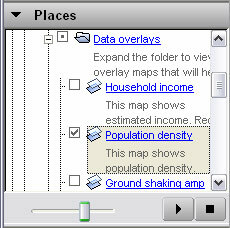 Overlays provide detailed information on population density, household income, liquefaction and landslide potential as well as underlying geology. In addition, students can draw on the native Google Earth layers such as 3D buildings, roads, railways, terrain and public buildings, to inform their decisions. There is plenty of scope for independent research, and students should be able to access the highest levels of achievement in both Geography and ICT. I would suggest that students work in small groups, each having access to a computer with a Google Earth installation. By far the best work will be obtained if the class is given a whole morning to complete the assignment. This will allow plenty of time to introduce the essential skills, work on the assignment and complete a report and / or peer assessment. Discuss the idea that planners try to minimise the worst effects of earthquakes by designing safer cities. How might they do this? The BBC film Tokyo Earthquake (QED series) is a great introduction as well. I have prepared a page about building an earthquake shaking table here, which might make a good precursor or follow-up activity. The Earthworks text mentioned previously has several pages of useful material. Here is an interesting link to real-time earthquake maps of North California and Nevada. Incorporating these resources into the lesson will surely lend extra credibility. The San Francisco project kmz file opens with an overview of the Bay Area, and the web cam and panorama placemarks active. I recommend allowing students to spend time exploring the city using the panoramas and webcams, together with features such as the 3D buildings and terrain from the Layers window. Students should be guided to look at each of the project layers in turn, possibly starting with the one showing the Bay Area faults. This can be zoomed out considerably, in order to show the situation of San Francisco in relation to the major California fault zones. The map showing underlying geology and shaking potential should be examined in conjunction with the very detailed layers showing the areas at risk of liquefaction and landslide. The slider widget that varies the transparency of overlays is a crucial function! The teacher should demonstrate this, as well as the technique for turning layers on and off. This screen shot shows the slider widget. It's only visible when an overlay has been selected. There is a dynamic network link to the locations of recent earthquakes which might correlate well with the Bay Area faults map. 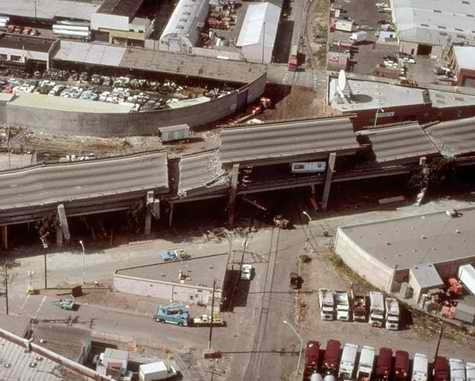 At the time of writing, two earthquakes had just occurred on the San Andreas fault. Students also need to understand how to make use of the generic layers within Google Earth, and at this stage it might be advantageous to teach them how to manage the My Places folder if they are unfamiliar with its function. The students could then be directed to consider the requirements for a new hospital building. 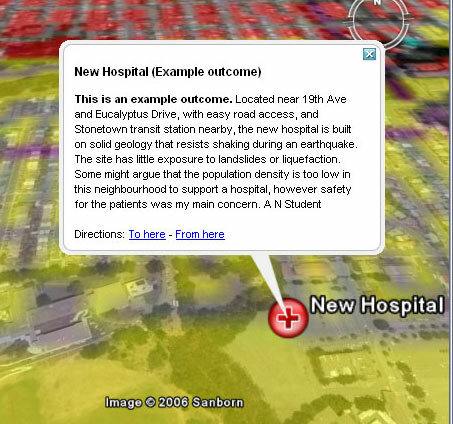 They can locate existing hospitals by activating the appropriate layer in Google Earth, and consider what other information might be relevant, for example population density and infrastructure such as roads and rail. The ruler can be used to work out the dimensions of the site, and the distance to other features. Students then draw simple polygons to identify and annotate areas of the city that would be suitable for the new hospital. The technique is mentioned on this page. Annotated placemarks are just as effective. update: The Street View in Google Maps is a brilliant additional resource, allowing students to see an eye-level perspective on their choice of location. The task can be extended to challenge the whole ability range. Students could be asked to locate a variety of other features with different requirements, for example a new sports stadium, or residential area with carefully annotated placemarks. Using the drawing tools, they can design and locate features using the drawing tools, for example new roads or railways, and as I show on this page, ambitious visions of 3D buildings can be realized with software such as SketchUp. Some students might progress to the stage where they add their own overlays, for example a map to show the risk from dam inundation. Students should be taught to manage and save their work using Google Earth's My Places folder structure. It is a simple matter to save work in progress, including any new polygons or placemark information in a folder which can then be exported from My Places to another location, for example My Documents, or to removable media for homework. Some actual work produced by my own students can be seen here. 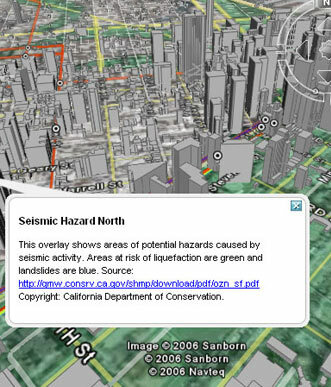 The USGS has just published a superb new resource on the earthquake hazard in San Francisco. A wide range of data is available as Google Earth files, some of these complement, or even replace the files included in the project folder. See some work produced by my own students here. Alan Parkinson is producing a Google Earth Users Guide on his Geography Pages site.